« What exactly is a Single Lens Reflex anyway? Is your Minolta SRT model looking a little rough? What about your old reliable XD-11? Does it still look pristine? Maybe your XG-7 could use a little refurbishing. If you got an old, but well loved Minolta SLR, you can make into something very special. With a little elbow grease and a replacement leather kit from CameraLeather, you can turn your run-of-the-mill SLR into a one-of-a-kind show camera. While CameraLeather won’t necessarily make your camera take better photos, it will definitely increase your pride in ownership. I’ve always found that when I value a special instrument, I tend to work harder at getting a result that matches the quality of the tool. So in the end, these kits might just improve the caliber of your photos after all. Make your classic Minolta a real standout. CameraLeather offers a wide variety of colors and textures as these SRT models demonstrate. CameraLeather, as the name implies, offers a line of leather kits that any handy DIYer can use to resurface the grip area on their classic SLR. DSLRs, with their molded, composite bodies probably don’t lend themselves to leather covering. The older metal bodied cameras, on the other hand, are the perfect target for one of these leather kits. Since CameraLeather offers a wide range of colors and styles, you an customize your aging SRT or XD-11 to look better than new. Best of all. the kits are inexpensive, ranging in price from to $10.50 for synthetic materials to $44 for the exotic kid skins. Most of the pre-cut covering kits for 35mm SLRs are less then $20.00. The biggest investment required in the time you invest to remove the old overing and apply the new one. CameraLeather offers an incredible array of coverings. To my mind, these leather coverings evoke an earlier era, when wealthy people would tote beautifully crafted classics with them on far flung-travels. I could imagine seeing one of these aboard the Orient Express or on a trip up the Nile in one of Agatha Christie’s novels. These cameras wouldn’t look out of place in a stateroom on the Titanic, either. Too British for you? How about a fellow named Gatsby slinging one of these over his shoulder, bound for a day of yacht racing off Newport, Rhode Island. I would think a leather endowed XD-11 would be just his thing. Ok, enough romanticizing. These leather covered cameras are uber-cool, but are they practical? I don’t want to lock my camera up in a display case — my cameras are for taking photos. How well will these coverings hold up? How difficult is it to recover Minolta SRT and X series SLRs? 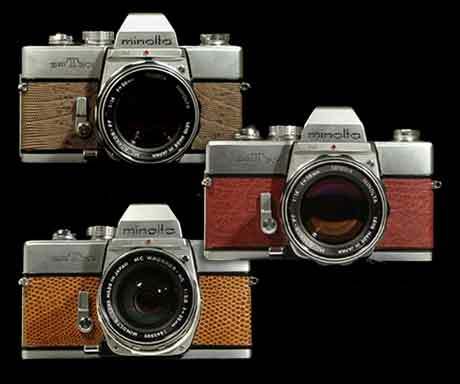 Minoltas, as a group, are pretty easy to recover. Some of the old hard coverings on the SRT’s require some effort to get off cleanly. The XG, XD and X-700 series are easy to strip and clean. The “support” section of the site is fully applicable to all Minolta SLR’s. How well does the leather stand up in use? Can someone use the camera regularly without damage from sweaty palms or oily skin? All our materials hold up well in normal use. Some of them are very tough, like the reptile leathers. The kid skins in the lighter colors may show some dirt in hard service. We do not get any complaints about early failure, and we have been doing this since 2000. Has anyone tried your fabric on lens barrels? After long use, some of the rubber grips on my Rokker lenses have stretched or come off completely. It might be interesting to buy a matching fabric sheet and cut it to fit the lens, making the lens and camera match. Impractical? What do you think? Our “Griptac” material makes an excellent lens barrel grip, but the “gravel” texture seems to put most people off. It works great, but I can’t get too many people to use it; they are used to a checkered grip. I’ve found the best way to put a new focus ring on your lens is to buy an old Sears lens for $5 and cannibalize it! Hmm. This seems like a very interesting project. There are a couple of hitches, however. First, it’s been years since I actually shot film. I still have some of my old SLRs and it might be fun to take one out and play with it now and then, but the film train has pretty much left the station. And she ain’t ever coming back. Secondly, I am at a loss to think of which of my old SLRs I would want to cover. My old SRTs are pretty well used. They have been dropped, nicked, exposed to all manner of hard use — one has even been run over by an errant race car. Other metal bodied Minolta SLRs, like this XD11 are also good candidates for the leather treatment..
Don’t get me wrong, I’m not careless about my equipment, but sometimes getting the shot is more important than keeping the camera in pristine condition. So these scars are a badge of honor as far as I’m concerned. But I’m afraid an immaculate leather covering would clash with the scared metal housing. I would have to distress the leather to make it match — that doesn’t seem like a very good idea. I do have a mint Minolta SR-7 and I’m sure a leather covering would look great on it. CamaeraLeather doesn’t offer a kit expressly for the SR-7, but it is so close in appearance to the later SRT series that I think I could adapt a SRT kit. If not, CameraLeather sells uncut sheets of the adhesive backed leather so I could go that route and custom make my covering. But as I said, the SR-7 is in mint, nearly unused condition. It probably isn’t greatly valuable today, but I would guess in the coming years it might be worth something. But it I remove the original hard covering and replace it with leather, the camera probably will not have any real value to a collector. Sigh. Maybe I could look around for an old XD-11 on ebay. It would lend itself well to the refined look of leather and Minolta made enough of them that they wouldn’t be as much of a collector’s item as the older SR model. Leather is precut for every supported camera model. I wonder what it would be like to shoot film again? I’m going to have to think about that. I would never return to film in place of digital for my professional work…but it might be fun to haul around a leather bound film SLR for family events and the like. While I’m studying on the problem, if you have a suitable candidate for a leather treatment, check out the CameraLeather website. If you do try your hand at recovering an old Minolta SLR, send in some photos so I can share with other Alphatracks readers. 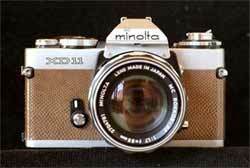 Who knows, maybe we can spark a revival of classic Minolta SLRs. This entry was posted in Camera Mod, Film Camera, Manual Focus SLR, Minolta, Photography. Bookmark the permalink. Post a comment or leave a trackback: Trackback URL.